Some people say that tortoises are easy to keep indoors (“all you need is a (fill in the blank) gallon tank, a good light and a heater and you’ll be fine”), while others feel very strongly that tortoises are just plain not suitable indoor pets because of their housing needs. We believe that tortoises should spend as much time as possible outside, and when indoors, every effort should be made to provide the sort of housing they need- but the keeper needs to understand that it is not cheap or easy to do this. Hatchlings are often kept in 20 gallon or so aquaria or plastic tubs. Up to about 4-6 inches (10-15 cm) can be kept in larger aquaria or big plastic tubs. Larger tortoises often need tortoise tables, indoor greenhouses, dedicated rooms, etc. For 1 tortoise, 8 shell lengths by 4 shell lengths of the largest specimen. For 3-4 tortoises, 10% above that. For 5 or more, add 20% more per tortoise. Again, the numbers listed above are guidelines, not absolutes. Some tortoises are very aggressive and territorial and would need even more space than that suggested while others are at least semi-social and tolerate crowding. Many keepers also feel that smaller indoor enclosures are OK as long as they have access to larger outdoor spaces much of the year. The height of the habitat should be enough that the lights or heaters cannot hurt the animals, and they cannot climb on anything in the habitat to escape. Are tubs or aquariums better for smaller tortoises? Tubs are generally lighter, cheaper, and come with lids we can modify for our purposes. They are also waterproof and the opaque sides won’t bother some tortoises the way clear sides sometimes do. On the other hand, they smell of plastic which some people believe may cause health issues over time, and the opaque sides makes them feel slightly claustrophobic- at least to the keeper. Plastic tubs are generally less attractive overall, especially the larger sizes. Aquariums are more durable, and can be quite cheap on Cragislist or other sources- especially if they leak or have a minor crack. While both tubs and tanks can be beautifully planted, it is easier to see and appreciate in an aquarium. Aquariums have a wide variety of bases and covers available and can look very attractive even in a living room. Some people are concerned about airflow, but it would be the same as in a tub. Others are concerned about overheating when they sit in the sun, but that is easily managed. Some tortoises seem to be stressed by the clear sides, but that can be managed by just placing some sort of visual barrier along the bottom few inches. Open tops allow the best air flow, but also allow heat and humidity to escape. Because of the nature of hot, humid air, you must cover most of the top to trap it in place. Completely covering the top, however, creates air flow problems and traps warm, humid, stale air which fosters mold, mildew, and germs that can lead to respiratory infections. Some air flow is always necessary. The best controlled air flow happens when small intake vent holes can be placed low on one end, and about the same size holes can be made high on the other end. Ideally we would make it so we can adjust the amount of ventilation, such as covering the holes with tape. Medium-sized enclosures can be easily made in almost any size you need out of almost anything available. Most of the time they are build as a simple box that is open on either the front or top. Sliding plexiglass doors are often used to cover an open front. Some people even make really cool coffee tables or other furniture out of these! There are few real rules about making these enclosures, but try to make it as waterproof as possible, especially for high-humidity species. One challenge is to use a water-proofing method that does not emit fumes that can potentially harm the tortoises and that will hold up over time. Water-based poly sealant and caulked corners are a common option. A bigger challenge for these enclosures is heating and lighting. This usually either means holes in the top for the lights, or making the box big enough to include the devices inside- and figuring how to wire them safely! A surprisingly effective medium-sized enclosure can be made out of a simple PVC pipe framework with a skin or shell of any combination of sheet plastics, clear or opaque vinyls, etc. 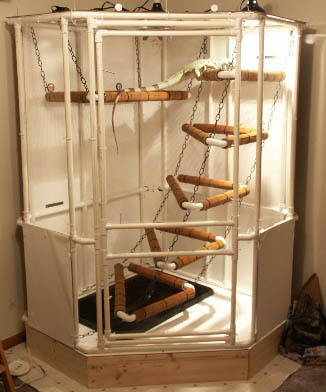 This example was done for iguanas and is fancier we would need, but shows the basic idea. A tortoise table is just a large, flat, open-topped box- often described as a shelf-less bookcase on its back. While they can theoretically be any size, they become more difficult to manage over about 72 x 36 in. Any simple box-like structure can be used, and made waterproof with a plastic liner. Open-topped tables quickly loose all heat and humidity to the room they are in, so you either need to heat and humidify the entire room, or the table needs some sort of cover. A simple tent-like frame covered in clear vinyl works nicely. Tortoise tables can get very heavy with the substrate and everything else, so make sure they are sturdy and placed where you do not need to move them much. It is generally easier to clean and enjoy a low table than one that is closer to waist height. Locate the space. It should be near electrical outlets, and being close to a window is a bonus. The best space will have a floor that never gets too cold. Outline the space with wood or plastic boards 12-24 in high. Make sure they are well secured to each other. If possible, use the room’s walls for some of this. Line the floor space, first with rigid foam board for insulation, then with a single piece of plastic liner that runs up the walls at least 12 in. Build a PVC or wood framework to hold plastic sheeting and/or more rigid foam boards to make the walls of the space. This space should be at least 4 feet high for easy access and cleaning. The door can be a simple flap of plastic that snaps or Velcros in place. Add several inches of substrate (and substrate heating if desired), and hang lighting and overhead heating from the framework. Tortoise Trust– this article also links to several other excellent resources at the Trust. Tortoise Yard– Good collection of well-done care articles, especially for red-footed tortoises. The internet also has several articles and videos for indoor greenhouses, etc. that help as well.